Rosh Hashanah is the Jewish New Year. Just as Catholics have a special religious calendar, so do Jews — and it begins with Rosh Hashanah. The holiday is celebrated over two days with prayer services where a horn called a shofar is blown 100 times. There are also family meals with symbolic foods such as apples dipped in honey. This year, Rosh Hashanah started on the evening of 16 September. Speaking of the Jewish New Year, it’s now 5773, according to the Jewish calendar. Tradition holds that year 1 began about a year before Creation. The first day of year 1 is equivalent to 7 October 3761 B.C. Yom Kippur is the Day of Atonement. This is the holiest day of the year for the Jewish people. It is marked by 24 hours of fasting and repentance — no food, no drink, no nothing. Before Yom Kippur, you are supposed to seek forgiveness for your sins against God and other people. This year, the holiday started on the evening of 25 September. Sukkot is the Feast of the Tabernacles, which are a kind of hut covered in leaves. These huts are meant to bring to mind the fragile dwellings in which the Israelites lived during the 40 years in the desert. The feast lasts for seven or eight days, and holiday meals are eaten inside of the sukkot. Sometimes, very devout Jews sleep inside them, too. This year, Sukkot starts on Sunday, 30 September. “Chag sameach” is how you can greet your Jewish friends during Sukkot. It means “joyous festival” in Hebrew, and it actually works for just about any holiday. By the way, why I am telling you this? Because CNEWA works on behalf of the Holy Father to promote understanding and friendship between all who worship the one God — Christians, Muslims and Jews. That is a very fundamental part of our mission. Chag sameach! September has been a busy month for CNEWA Canada. On 5 September, the premiere of Salt + Light Television’s newest documentary Across the Divide took place in Canada’s largest city, Toronto — after premieres in Vancouver and Halifax in June. The Canada-wide tour has been an exciting partnership for CNEWA Canada with Salt + Light, Canada’s Catholic television network. Together, we have collaborated to tell a unique story of our Christian brothers and sisters in the Holy Land. Shot on location in the Holy Land, Across the Divide offers a glimmer of hope for the divided region by telling the heroic stories of staff and students at Bethlehem University, a CNEWA-supported institution. It was a joy to be present at this event in my hometown, Toronto, along with the national director for CNEWA Canada, Carl Hétu, and over 350 others. You can see an article on the event in Canada’s Catholic Register newspaper. On 19 September, the film premiered in Ottawa, Canada’s capital city and home of CNEWA Canada’s office. The screening was attended by our staff and over 250 people. To put on this wonderful event, I had the pleasure of working behind-the-scenes with Salt + Light’s team and an awesome group of young adult volunteers from the Ottawa area. Each film premiere began with a cocktail reception and concluded with a special question-and-answer panel discussion. The panel included Carl Hétu, along with Cardinal Thomas Collins, the Archbishop of Toronto, and Terrence Prendergast, the Archbishop of Ottawa. Both archbishops are members of CNEWA Canada’s Board of Directors. See the video below for highlights from both events. To support the efforts of Bethlehem University, visit our website. Coptic Christians flee Sinai (Associated Press) Coptic Christian families have fled their homes in a town in Egypt’s Sinai Peninsula, fearing for their lives after receiving death threats from suspected Islamic militants, a local priest said Thursday. Father Youssef Sobhi said that Islamic militants dropped leaflets on the doorsteps of shops owned by Copts in the city of Rafah near the border with Gaza and Israel, ordering them to leave town within 48 hours and making an implicit warning of violence if they failed to do so. Two days later, masked militants on a motorcycle opened fire on one of the shops before speeding off, Sobhi said. No one was hurt in the shooting. Patriarch Kirill defends ties to Kremlin (Reuters) The head of the Russian Orthodox Church on Friday rejected criticism of his increasingly strong relationship with President Vladimir Putin, saying that close ties between the church and state were good for society. A Benedictine priest — in Rome recently for a gathering of monastic communities — spoke with Catholic News Service and suggested that one important lesson may lie in how to pray. "It's Worth It to Seek Some Kind of Unity"
CNEWA’s Msgr. John Kozar was in Canada earlier this week for the meeting of the Canadian Conference of Catholic Bishops, and he sat down for an interview with the Salt + Light TV network. He talked about his experience being in Lebanon for the papal visit, and shared some of his own thoughts about the plight of Christians in the Middle East. His interview begins at the 5:30 mark below. Asela’s orphanage school owes a good deal of its recent success to Father Renato Saudelli, I.M.C., who was appointed its director in 1991. An ardent advocate for sustainable development, Father Saudelli has integrated vocational skills training with the school’s academic curriculum so every student has a better chance at succeeding once they enter the work force. Father Saudelli’s legacy, however, has been his work with the fine arts and music programs at the school. Thanks to his tireless efforts, these programs have thrived in recent years. An artist himself, the Italian-born priest threw his weight behind the school’s art program the moment he assumed leadership responsibilities. With honest effort, patience, individual attention and, of course, the best available art materials, Father Saudelli believes all children can discover the joy of, as well as their unique talent for, creating art. For this reason, he encourages the disabled children to take advantage of the art program. Artistic expression using one’s hands, he believes, can help instill a sense of pride, particularly in those who may be physically handicapped in other ways. A prospective graduate of the Yared Music School at Addis Ababa University, Matheas Hussein plays part-time in a local band, Harlem Jazz, which enjoys some celebrity in Addis Ababa. After graduating from the Consolata Fathers’ school, Mr. Hussein was recruited by a private college. His passion for music, however, led him to the Yared Music School. He persistently applied for admission, never losing hope. Finally, after three years, he was accepted to the program. Read more on Revealing Hidden Talent. "Western Society Finds Its Moral GPS Has No Fixed Points"
Yesterday, the head of the Ukrainian Catholic Church spoke to Canada’s bishops, and had some harsh words about the threat from secularism in the West. The former Soviet Union used that approach to religion, he said. ”Separation of church and state has become separation of faith values from society, yet our mission is to preach the word of God to all and to be a constant sign of God’s loving presence through social ministry,” he said. 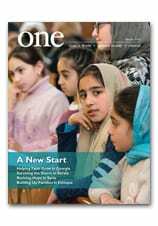 In the September issue of ONE, read how Armenians are practicing their faith in western Ukraine in the story Restoring Faith.